Has Apple heard our pleas for a lower-cost modular Mac? The single processor 1.8 GHz Power Mac G5 knocks US$500 from the price of it’s dual-processor sibling while matching it in almost every specification. The only significant difference, besides a single CPU, is the use of a 600 MHz memory bus vs. 900 MHz on the dual processor model. Apple’s cheapest Cinema Display, the 20″ model, adds $1,299 to the price, but the Power Mac can be used with a conventional CRT display or third-party flat panel display. The Power Mac supports dual monitors, but the iMac can only mirror what’s on the built-in display. The Power Mac has an 8x DVD burner vs. 4x on the iMac G5. 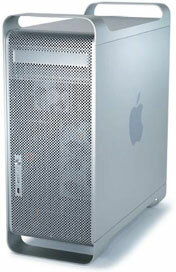 The Power Mac has three PCI slots and room for additional internal hard drives; this expansion is lacking in the iMac. The Power Mac has FireWire 800, while the iMac is limited to FireWire 400. In terms of performance, the 1.8 GHz iMac G5 and 1.8 GHz Power Mac G5 Single should be nearly identical, so it comes down to expandability and display flexibility vs. the convenience of having everything in a slim case. Macworld also compared performance of this single CPU 1.8 GHz model with last year’s 1.8 GHz single processor G5 using the same hard drive and graphics card from the new model to determine how system bus speed impacts performance. In every test but one, the new model was 1-4% slower than last year’s model. Note that this is one of Apple’s entry-level G5s, which means it uses 33 MHz PCI slots instead of 133 MHz PCI-X and has 4 memory slots instead of 8.
iBook, Power Mac 1.8GHz Benchmarks, James Galbraith, Macworld, 11.02. How the slower memory bus on the new single CPU Power Mac G5/1.8 GHz impacts performance.